In 1938 James McDonnell found himself diligently at work with the Glenn L. Martin Company in Baltimore, Maryland. 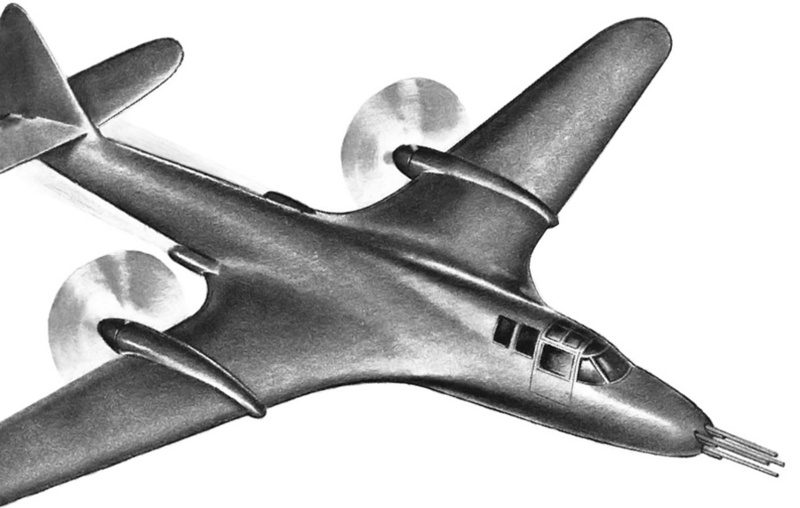 While employed with Martin, McDonnell had designed a number of successful aircraft and was now focused on a streamlined design with the engine mounted in the fuselage. McDonnell had worked for the Martin Company since 1933 but was very interested in starting his own aircraft company. Late in 1938, he left Martin. Artwork of the McDonnell Model 1 with a four-gun nose. The McDonnell Aircraft Corporation was incorporated on 6 July 1939. The company began work out of St. Louis, Missouri and quickly obtained subcontracted work for other aircraft manufacturers. In addition, McDonnell submitted a few aircraft proposals to the United States Army Air Corps and Navy. Although none of the proposals led to any contracts, they did open the door for McDonnell to be included in the Air Corps Request for Data R40-C, officially issued in February 1940. R40-C was an informal Request for Data that encouraged aircraft manufacturers to propose unorthodox aircraft. These aircraft would need to be capable of at least 450 mph (724 km/h), but preferably 525 mph (845 km/h), and meet other requirements outlined in Type Specification XC-622. R40-C asked aircraft engine manufacturers to develop new power plants. A total of 26 aircraft designs were submitted by six selected aircraft companies. These designs included a mix of eight different engines from four engine companies. An additional engine from an additional manufacturer was later added. Three-view general arrangement drawing of McDonnell’s Model 1 from November 1939. The drawing seems to illustrate a five-gun nose: two machine guns housed in the fuselage sides, two more (or cannons) toward the nose, and one cannon (possibly 37 mm) in the center of the nose. McDonnell’s answer to R40-C was the Model 1 (its first design) officially proposed on 11 April 1940. Four Model 1 variations were submitted that differed only by engine type. While the Model 1 design appeared fairly conventional, it was possibly the most radical of the designs submitted. The Model 1’s shape was a direct evolution of concepts James McDonnell was working on during his last days with the Martin Company. The Model 1 featured unprecedented streamlining and incorporated airfoil-shaped fillets where the wing and fuselage joined. The proposed engines were the 24-cylinder Allison V-3420-B2, 24-cylinder Pratt & Whitney H-3130, 24-cylinder Pratt & Whitney X-1800-A2G, and 42-cylinder Wright R-2160 Tornado; all were liquid-cooled. Regardless of the type selected, the engine was buried in the fuselage aft of the pilot. 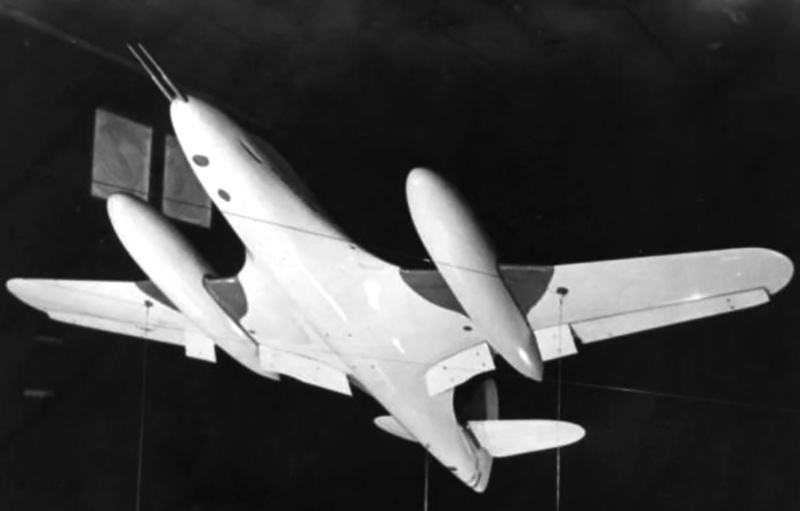 Engine power was transmitted via extension shafts and right angle gear drives to a pair of two-speed, four-blade, 10 ft 7 in (3.23 m) diameter, pusher propellers mounted on the wings. The aircraft featured gear-driven radiator cooling fans. Originally the aircraft was to be armed with two .30-cal. machine guns and two 20 mm cannons, but armament varied throughout the design process. However, armament always consisted of a combination of two to four machine guns and one to four cannons. Allison V-3420-powered McDonnell Model 1 cutaway dated April 3, 1940. Armament now includes six guns: two machine guns in the fuselage sides, two more (or 20 mm cannons) toward the nose, and two 20 mm cannons in the nose. The X-1800 and R-2160-powered designs did not meet the specifications of XC-622 and were dropped from the R40-C competition. With a two-stage supercharger for the V-3420 engine and a two-stage, two-speed supercharger for the H-3130, both engines provided sufficient power for their respective Model 1 designs to achieve the XC-622 specifications. The Model 1 had a 45 ft (13.7 m) wingspan and was 45 ft 4 in (13.8 m) long. With the Allison V-3420, the aircraft weighed 13,826 lb (6,271 kg) and had a maximum speed of 383 mph (616 km/h) at 5,000 ft (1,524 m) and 448 mph (721 km/h) at 20,000 ft (6,096 m). With the Pratt & Whitney H-3130, the Model 1 weighed 14,800 lb (6,713 kg) and had a maximum speed of 385 mph (620 km/h) at 5,000 ft (1,524 m) and 454 mph (731 km/h) at 20,000 ft (6,096 m). It would take an estimated 42 months to develop the engine and power drives for the Model 1. In addition, the Model 1 was the heaviest aircraft in the competition. These and other factors resulted in the two remaining Model 1 proposals to be ranked 21st and 22nd out of 26 submissions. Even so, the Model 1 did interest the Air Corps enough for them to purchase engineering data and a wind tunnel model on 6 June 1940 for $3,000. This was the McDonnell Aircraft Corporation’s first sale to the Army Air Corps. The new engines involved with the R40-C competition became known as the “hyper” engines, an abbreviation of high-performance. The aircraft that won the competition were the Vultee XP-54 Swoose Goose, Curtiss XP-55 Ascender, and Northrop XP-56 Black Bullet. All were built and were pusher designs that failed to meet expectations and were fraught with technical difficulties. None of the hyper engines or R40-C aircraft entered production. The Model 1 was developed into the McDonnell XP-67 Moonbat that, although not successful, was built and did fly. 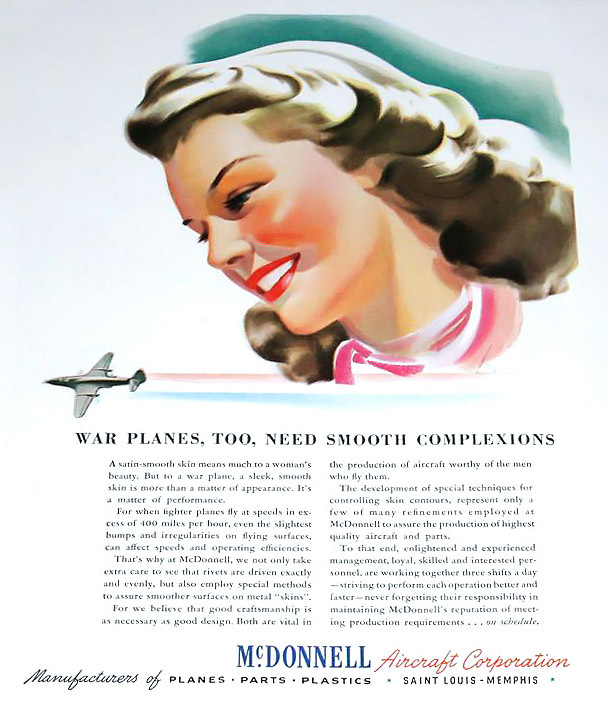 McDonnell Aircraft Corporation ad featuring the Model 1. This entry was posted in Aircraft, World War II on 7 September 2012 by William Pearce. There is something passing strange about those specs for -3420 ship. Compare the XP-67 with its much smaller engines, but similar size and apparently more weight, and with the XP-58 with the -3420s but much bigger and heavier. Indeed, the Model 1 is not so different in specs from the single -3420 powered P-75A. A very strange design. The comment also applies to H-3130. And I am assuming those are empty, not gross weights. The performance of the XP-67 is usually described as disappointing, but if you look at the speed attained with the amount of power actually available, it is very impressive. And arguably the coolest looking piston engine fighter ever. Oops — I didn’t get that the plane had a single engine with shafting to outboard props! 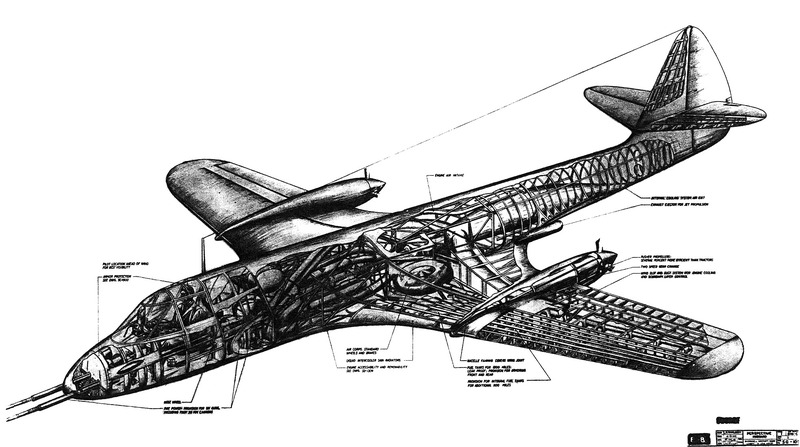 The Soviets had a plane about the same time that was proposed with a central engine and outboard props — also unbuilt. Hmmm — if a regenerative version of the -3420 was developed (cf late war -1710), that would have been almost 6000 HP. Would have needed a high speed prop and swept wings and would give the -262 a run for its money at combat altitude.